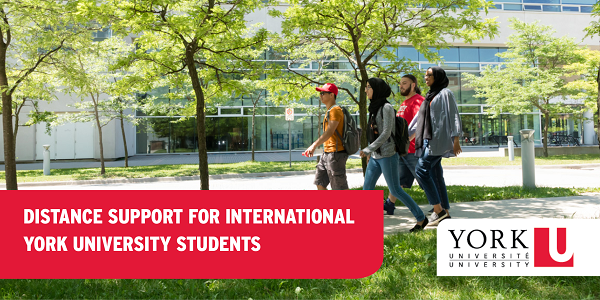 Distance Support for International York University Students - StudyinCanada.com! Global Connections (GC) is a program designed by York International(YI)with the goal of helping you prepare for life at York University and in Canada once you become a York student. YI has Global Liaisons, a team of multilingual and multicultural international students, who are available to chat with you or answer questions online before and after you arrive. On campus, they organize coffee breaks and other events for current international students throughout the academic year and summer. They look forward to meeting you online and in person! Welcome! Your Home Away from Home! – An Introduction to York International and the supports and services that they provide. York & U: Campus Life – A summary of co-curricular activities on campus for you to enjoy when you are here! Pack Your Bags: Pre-Arrival Checklist – Your last webinar to watch before you arrive, this workshop is a step-by-step breakdown of all the necessary things you need before you arrive in Toronto and at York! At York U, we understand how difficult it can be to choose a university and move away from home. We are a diverse and supportive community that supports and empowers students as they transition into and through their university experience. Consider us your home away from home. If you have any more questions, reach out to us on Twitter or Facebook. We look forward to meeting you online and in person.